In addition, sophisticated techniques of restoration, developed at the Institute for preserving valuable buried cultural materials, have been applied in the preservation of sites and artifacts throughout the world. At the Nara palace site, reconstruction of the Former Imperial Audience Hall is underway, following that of Suzakumon gate. The techniques of reconstruction used in these projects are being applied in the presentation of historic sites throughout the country. In addition, the Institute also serves as a center for the training of, and for conducting joint research with, both local government employees involved in archaeological excavations, and foreign researchers. Nara National Research Institute for Cultural Properties, was founded in 1952 as an auxiliary organization of the National Commission for Protection of Cultural Properties, the predecessor of the current Agency for Cultural Affairs, with a view to conducting research on cultural properties. At the time of its inception, the Institute had three research divisions, specializing in history, architecture, and art, as well as a General Affairs Division. 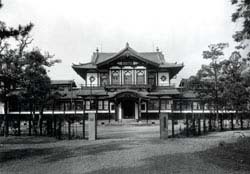 The growing necessity to protect the Heijo palace site led to the inception of the Division of Heijo Palace Site Investigations in 1963. In 1973, the Division of the Asuka/Fujiwara Palace Site Investigations was established, and in 1975, the Asuka Historical Museum was opened, prompted by a Cabinet resolution made in 1970 as part of the government's efforts to preserve the cultural properties of the Asuka area. In order to help meet the demand for resucue excavations conducted by local governments, the Center for Archaeological Operations was established in 1974 to train local excavators and provide advice to local authorities. As part of Japanese Government's reform initiatives, national research institutes belonging to government ministries and agencies are undergoing reorganization. Consequently, the National Research Institute for Cultural Properties, Tokyo and the Nara National Cultural Properties Research Institute were integrated and reorganized as branches of the Independent Administrative Institution in April 2001. The head office for this independent institution is located at the National Research Institute for Cultural Properties, Nara.